Hollywood, CA - March 29, 2000 - As part of its creative strategy to further reach kids and families, Nickelodeon Movies has joined forces with several major partners for a unique "Rugrats in Paris - The Movie" Passport Promotion. Over 2,000 theaters showing "Rugrats in Paris", as well as Kids Footlocker, Lady Footlocker, Mattel and Mott's, will join with Nick Movies to drive awareness of the film, and send one lucky winning family to Paris. The Passport Promotion will be supported with a pre-promotion passport mass mailing in a Fall issue of TV Guide, along with on-air spots and major support in theaters and at retail. Nick Movies has also announced several additional promotional partners for "Rugrats in Paris - The Movie". Among these are Gateway, Kraft Macaroni & Cheese, Kraft Mayonnaise, Kraft's Post Cereal brands, Jell-O Yogurt, Oral-B, Simon & Schuster and Farley's. For Rugrats fans, the Passport Promotion journey begins when they see the new film. Movie goers will receive their very own "Rugrats in Paris" passport, which has a place for a personal picture, a two-page commemorative comic of the movie's plot, an instant win game and an entry form for a chance to win a "Rugrats in Paris" family adventure of their own. To enter for the chance to win the trip, consumers will have to collect at least four of seven different passport star stamps, the first "star" being the theater's "Rugrats in Paris" ticket stub. Kids and families will have a variety of other ways to get their four stars - at Burger King; a major toy retailer to be named shortly; on Mattel toy boxes; or on Nick.com -- though the movie ticket stub is required. (Later, the ticket stub requirement was dropped and there are now a total of 6 stamps available, though you still must collect 4 to enter; this rule was changed, as the very first rule says "No purchase necessary".-- SM) Grand prize is an all-expenses paid trip to Paris, a Rugrats tour of the city, first class accommodations, and 200,000FF (US$50,000). The Passport Promotion will be augmented by a six-to-eight week program in over 1,200 Kids Footlocker/Lady Footlocker stores. In addition, a wide-ranging Mott's campaign is expected to begin in the summer to promote Rugrats Watermelon and Fruit Punch, Single Serve Apple Sauces, Multi-Serve Bottles of Juice, Single-Serve Juice Boxes and Fresh Apple Products, with substantial media, in-store and on-pack support. [Specially-marked Rugrats In Paris packages] will be on retailers' shelves September through December. Mott's is giving away over 1,000 prizes via an on-pack instant win promotion. Ten grand prize winners will receive a suitcase full of Rugrats toys by Mattel. In addition, 100 first prize winners will receive a Sing and Swing Angelica doll and a Bounce and Babble Dill (sic) Doll. Two hundred fifty Cheer up Chuckie dolls will be given out as second prizes and 700 third prize winners will receive a Rugrats My Size puzzle. "This year we are delivering our first ever instant win game on specially marked packages of juice and apple sauce," said Product Manager, Mike Ryan. The instant win game promotion will be supported with a national full page FSI (newspaper coupon insert) in November, as well as point of sale materials and on-shelf promotional packaging. In addition, Mott's licensed Rugrats apple sauce products will deliver free in-pack sticker tattoos inside specially marked fruit punch and watermelon flavors. The sticker tattoo promotion will be supported by a national half-page FSI, a full-page print ad in Nickelodeon Magazine, point of sale materials and on-shelf promotional packaging. The first Passport Promotion on-air spots will likely run from mid-to-late October and specifically support the contest, with a second wave of commercials promoting the movie set to hit in mid-November. Gateway, which will utilize a two-phased six-week campaign to promote a Rugrats Astro PC in over 300 of its U.S. retail outlets. The promotion will also include bounce-back offers and be supported in-store, in-theater and with kid-directed media. Kraft, which will promote its Macaroni & Cheese, Mayonnaise and Jell-O Yogurt brands with on-pack Rugrats-related coupon offers. Kraft will tap the power of the Rugrats further with its Post Cereal brands, providing TV and print media support, as well as on-pack and in-store coverage. Oral B, which is planning a special pack promotion that includes a "Rugrats in Paris" activity book and crayons wrapped with Rugrats-licensed toothpaste and tooth brushes. Simon & Schuster is creating in-store displays to support its "Rugrats in Paris" novel book, which is set to include a concession coupon. The book will also be promoted online at simonsayskids.com. Farley's, which has a line of successful licensed Rugrats Fruit Snacks, will hold a "Rugrats in Paris" / Paramount Parks on-pack sweepstakes. The promotion will be supported with TV spots highlighting the contest. "We have always set very high standards and goals with the Rugrats franchise, but the number of partners and the level of excitement for "Rugrats in Paris" is really amazing," said Pam Kaufman, Senior Vice President, Promotions Marketing, Nickelodeon. "With the Passport Promotion, we intend on taking strategic, creative marketing and promotions to a new level." Added Albie Hecht, President of Film and TV Entertainment for Nickelodeon, "The next Rugrats movie is very special, and we think it will resonate with audiences of all ages, which is underscored by promotional partners as diverse as Gateway and Footlocker. We expect kids around the country to be clamoring to see this movie, and to extend their experience by collecting some very cool stamps and passports." As with all contests, a set of rules must be followed in order to win. Here are the rules (from Nick.Com); this applies ONLY to the stamp-collecting game. Official passport entries may also be deposited at any participating Kids Footlocker Store for a free "Rugrats In Paris - The Movie" poster. Limit one (1) poster per completed official passport entry deposited at Kids Footlocker only while supplies last. Enter as often as you wish, but each entry must be mailed and/or deposited separately. Overnight entries and entries sent via telefax will not be accepted. Entrants must be between the ages of 5 and 15 years of age as of January 15, 2001. 3. Entries that are illegible, incomplete, altered, forged, counterfeited, tampered with in any way, printed by machine or otherwise mechanically reproduced will not be accepted. Sweepstakes sponsors are not responsible for entries that may be lost, late, delayed, mutilated or misdirected or for typographical errors in the entry forms or rules or postage due entries. All passport entry forms must be obtained legitimately. 4. Sweepstakes commences October 9, 2000 and ends January 15, 2001. 5. Entries must be deposited at Kids Footlocker by December 31, 2000 or received at the above address no later than January 15, 2001. Winner will be selected in a random drawing on or about January 31, 2001 by an independent judging organization from among all qualified entries received. Odds of winning will depend on the total number of qualified entries received. The Grand Prize Winner will be notified by telephone and mail within ten (10) days of being selected. 6. TO ENTER: Collect any four (4) "Rugrats in Paris" "passport stars" from the following participating partners or free by mail to fill in the spaces on your passport. You must collect any FOUR (4) passport stars to be eligible to enter. 6.2) Printed on the boxes of "Rugrats" licensed and specially marked packages of Mott's single serve apple sauce, multi-serve apple juice and juice boxes (approximately 70MM packages in total) while supplies last. 6.3) With the purchase of a Burger King Kids Meal from November 13 - December 10, 2000 while supplies last. 6.4) With the purchase of a "Rugrats in Paris - The Movie" ticket. Your ticket stub can be used as a "passport star." 6.5) Download a "passport star" from rugratsinparis.com from October 9 - December 31, 2000. 6.6) Free at registers while supplies last at participating Kids Footlocker or Lady Footlocker Stores from October 9 - December 31, 2000. 6.7) Available while supplies last from November 1 - December 31, 2000 with any purchase in the register lanes at participating Toys R Us stores or with any purchase on Toys R Us.com. One game piece request per envelope. Residents of the states of Washington and Vermont may eliminate return postage. The total estimated retail value of Grand Prize $75,000.00. Arrangements for prize fulfillment to be made by MTVN in its sole discretion on or about January 31, 2001. Dates of Grand Prize trips to be determined by MTVN at its sole discretion. 8. Grand Prize is non-transferable and has no cash equivalent except as herein indicated. Substitution of prizes by Winner is prohibited. All meals, gratuities and expenses not set forth in the Grand Prize description are the sole responsibility of winner. MTVN reserves the right in its sole discretion to substitute any prize with a prize or prizes of comparable value. In the event any winner chooses not to accept his/her prize, or is unable to be notified, an alternate winner will be randomly selected from all of the remaining entries. Parent or legal guardian of Winner is solely responsible for all applicable federal, state, and local taxes. 9. Sweepstakes open to residents of the continental United States who are between the ages of 5 and 15 years of age as of January 15, 2001. Sweepstakes not open to employees and their immediate families of MTV Networks, Viacom International Inc., Paramount Pictures Corporation, Toys R Us, Inc., Mattel, Inc., Kids Footlocker, Motts, Inc. and Burger King Restaurants, Inc., or their parent, subsidiary and affiliated companies, licensees, advertising and promotional agencies (collectively the "Sponsors"), the independent judging organization, printing agents and any other sponsors. (ii) where permitted by law, granting the Sponsors the right to use the Winner's name, voice, and likeness for advertising and publicity purposes without additional compensation. All travelers must sign a release of liability and publicity release prior to ticketing. Entry into sweepstakes constitutes the winner and guests' agreement to sign such releases. Winner's receipt of any of the prize components of this sweepstakes is conditioned upon compliance with any and all applicable federal, state and local laws, rules, and regulations. Noncompliance will result in disqualification of winner. Void where prohibited or restricted by law. All entries become the property of Sponsors and will not be returned or acknowledged. Winner and their parent or legal guardian will be required within five (5) business days of receipt to sign and return affidavits of eligibility and compliance with official rules and all legal documents which MTVN may require (including a W-9 tax form). Noncompliance within this time period will result in disqualification and an alternate winner will be selected. 11. By participating in this Sweepstakes, entrants agree to be bound by these rules and the decisions of the judges and MTVN, which are final in all matters relating to this sweepstakes. All requests for list of winners or a copy of these rules must be received by February 15, 2001. In Canada, YTV, Famous Players theaters and Kraft Dinner (what Canadians call "Kraft Macaroni & Cheese") presented a similar passport promotion. The winner in the Canadian version gets a 7 day / 6 night trip for 4 to Paris, plus C$1000 (about US$650) in spending money. TORONTO, Dec. 7 /CNW/ - Participating Famous Players theaters showing "Rugrats in Paris", as well as Burger King, YTV and Kraft Canada, will join with Nickelodeon to drive awareness of the film, and send one lucky winning family to Paris. The Passport Promotion is supported with a major television, retail and in-theatre campaign. For Rugrats fans, the Passport Promotion journey begins when they see the new film. To enter for the chance to win the trip, consumers will have to collect at least three of five different passport star stamps, the first "star" being the theater's "Rugrats in Paris" ticket stub. Kids and families will have a variety of other ways to get their four stars -- at Burger King on the Rugrats in Paris themed tray liner; on specially marked boxes of Rugrats Kraft Dinner; at Famous Players from the Rugrats in Paris meal deal tray and on YTV by watching three back-to-back Rugrats episodes and filling in a secret password revealed on-air. Grand prize is an all-expenses paid trip to Paris, a Rugrats tour of the city, first class accommodations and spending money. Entries must be received by December 31, 2000. The three-week on-air campaign features promotional spots, promotional billboards, dedicated promotional pages on YTV.com, on-line banner ads, and in- theatre promotional crawlers. In addition, Kraft will further promote the Rugrats franchise with promotional offers on Post Cereals (Honey Comb, Alpha Bits, Sugar Crisp), Kraft Dinner, Lunchables, Cheez Wiz, Jello, Peanut Butter and Handi-Snacks and has provided TV and print media support, as well as on-pack and in-store coverage. 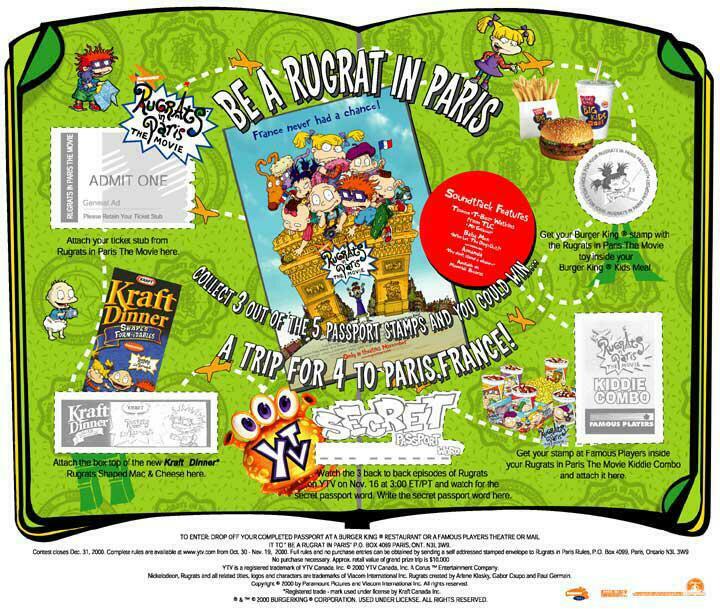 Print your Be a Rugrat in Paris passport by clicking here or pick one up at a Burger King restaurant. To enter, you have to collect three different passport stamps out of the 5 available. Get your Burger King® stamp with the Rugrats in Paris The Movie toy inside your Burger King® Kids Meal. Attach your ticket stub from Rugrats in Paris The Movie to the passport. Rugrats in Paris - The Movie opens in theaters on November 17, 2000. Watch the 3 back to back episodes of Rugrats on YTV on Nov. 16, 2000 at 3:00 ET/PT and watch for the secret passport word. Write the secret passport word on the passport. 3.Entries or stamps that are illegible, incomplete, altered, forged, counterfeited, tampered with in any way, printed by machine or otherwise mechanically reproduced will not be accepted. Contest sponsors are not responsible for entries that may be lost, late, delayed, mutilated or misdirected or for typographical errors in the entry forms or rules or for postage due entries. All Passport entry forms must be obtained legitimately. 4.Contest commences October 30, 2000 and ends December 31, 2000. 5.Entries must be deposited at Burger King Restaurants or Famous Players Theatres or received at the above address to be received before December 31, 2000. Winner will be selected in a random drawing on or about January 31, 2001 in Paris, Ontario at 2pm by an independent judging organization from among all qualified entries received. Odds of winning will depend on the total number of qualified entries received. The Grand Prize winner will be notified by telephone. Watch YTV on Thursday Nov. 16, 2000 for the Rugrats in Paris back to back special from 3:00 - 4:30pm (ET/PT) and look for the secret word to appear on the screen. Write the secret word on the space provided on the passport for one stamp. While supplies last purchase a box of the new Kraft Dinner Rugrats shaped Mac and cheese and affix the top of the box to your passport for one stamp. Go to a participating Burger King restaurant and receive a Rugrats in Paris stamp free with purchase of a Kid's Combo. Affix the stamp to your Passport for one stamp. Keep your movie ticket from Rugrats in Paris - The Movie showing at participating Famous Players movie theatres. Affix the movie ticket stub to the passport for one stamp. Purchase a special Famous Players Rugrats in Paris Kiddie Combo and receive a free stamp to affix to your passport for one stamp. 7.Contest prize is as follows: Grand Prize (1): Winner will be awarded a 7 day / 6 night trip to Paris, FRANCE for Grand Prize winner and three guests (If a minor winner must be accompanied by a parent or legal guardian). This trip includes: round trip economy airfare for four (4) from the international airport nearest Grand Prize winner's residence to Paris, France, standard hotel accommodations of YTV Canada, Inc.'s choice consisting of 1 room for 6 nights (quad residence); and $1,000CDN spending money in cash. The total estimated retail value of Grand Prize $10,000.00. Arrangements for prize fulfillment to be made by YTV Canada, Inc in its sole discretion. Trip must be taken before Dec.15, 2001 blackout periods may apply. Date of Grand Prize trip to be determined by YTV at its sole discretion. 8.Grand Prize is non-transferable and has no cash equivalent except as herein indicated. Grand Prize winner and his / her travelling companions will be responsible for transportation to and from the originating airport, meals, passports, gratuities, applicable taxes, incidentals, and all other expenses. Flights to and from Paris, France will be from the international airport located closest to the winner's home. Substitution of prizes by winner is prohibited. YTV reserves the right in its sole discretion to substitute any prize with a prize or prizes of comparable value. In the event any winner chooses not to accept his / her prize, or is unable to be notified within 7 days; an alternate winner will be randomly selected from all of the remaining entries. Grand Prize selected entrant will be notified by telephone. To qualify as a winner the eligible entrant must correctly answer a mathematical skill-testing question. A parent or legal guardian must sign the declaration and release form if qualified winner or travelling companion is under age the age of majority. 9.Contest open to residents of Canada. Contest not open to employees and those whom they are domiciled, of YTV Canada, Inc, Viacom International Inc., Paramount Pictures Corporation, Kraft Canada Ltd. and Burger King Restaurants, Inc., or their parent, subsidiary and affiliated companies, licensees, advertising and promotional agencies (collectively the "Sponsors"), the independent judging organization, and printing agents. [ii] where permitted by law, granting the Sponsors the right to use the winner's name, voice, and likeness for advertising and publicity purposes, including on ytv.com, without additional compensation. All travelers must sign a release of liability and publicity prior to ticketing. Entry into Contest constitutes the winner and guests' agreement to sign such releases. Winner's receipt of any of the prize components of this Contest is conditioned upon compliance with any and all applicable federal, provincial and municipal laws, rules, and regulations. Noncompliance will result in disqualification of winner. All entries become the property of YTV and will not be returned or acknowledged. 11.For residents of Quebec, any litigation respecting the conduct and administration of this publicity contest may be submitted to the Regie des alcools, des courses et des jeux, for a ruling. Any litigation respecting the awarding of a prize may be submitted to the Regie only for the purpose of helping the parties reach a settlement. 12.No responsibility will be taken for any failure of the website during the promotion or for any problems or technical malfunction of a telephone network or lines, computer on-line systems, servers, access providers, computer equipment, software, failure of any e-mail, on-line, or entry to be received by YTV on account of technical problems or traffic congestion on the Internet or at any website, or any combination thereof including any injury or damage to an entrant's or any other person's computer or property related to or resulting from playing or downloading any material in the promotion. YTV reserves the right, in its sole discretion to cancel or suspend all or part of this contest should a virus, bug or any other cause beyond the reasonable control of YTV corrupt the security or proper administration of the contest. Any attempt to deliberately damage any website or to undermine the legitimate operation of this promotion is a violation of criminal and civil laws, and should such an attempt be made, YTV reserves the right to seek remedies and damages to the fullest extent permitted by law, including criminal prosecution. Entries are subject to verification and will be declared invalid if they are illegible, mechanically reproduced, mutilated, forged, falsified, altered or tampered with in any way. The passports (and rules, which are not available online on their site) will be published in the April 2001 issue of K-Zone Magazine. The object of this contest is to collect 2 stamps, plus the ticket stub (which is, apparently, required in this version), paste them in your passport, then send it in to the address specified. 1. Information on "how to enter" and prizes form part of conditions of entry. Enter as many times as you wish by filling in the entry coupon in K-Zone magazine, but each written entry must be on an original entry form. 3. The competition commences on 19/03/01 at 9am and closes on 28/05/01 at 5pm. The winners will be the first entries drawn at the promoter's premises on 31/05/01 at 11am. Promoter may conduct such further draws on 12/09/01 at the same place as original draw in order to distribute any prizes unclaimed by this date, subject to any written directions given under Reg 37 of the Lottery and Gaming Regulations 1993 (SA). 4. Total prize value is $30,700 as at 12/02/01 and includes 1 x major prize and 100 x runner-up prizes. valid for only between 16/08/01 to 21/08/01 and valued at $26,000; 100 x runners-up will receive a Rugrats in Paris prize pack which includes a Rugrats in Paris kids t-shirt, a Rugrats in Paris cap, a Rugrats in Paris aeroplane, each pack valued at $45 each. Passports, visas, spending money, all other meals excluding breakfast and all other ancillary costs are winner's responsibililty unless otherwise states. Holidays are subject to flight and booking availabilities. Winners under the age of 18 must be accompanied by an adult travelling. Prizes are not transferable or redeemable for cash. 5. The judges' decision in relation to any aspect of the competition is final and binding on each person who enters. 6. Winners will be notified by mail and names of winners of prizes over the value of $100 will be published in The Australian on 28/06/01. 7. Entries remain the property of Pacific Publications Pty Ltd and cannot be returned. The entries may be entered into a database for future promotional, marketing and publicity purposes, unless otherwise stated by the entrant. Promoter reserves the right to publish photographs of winners. 8. The Promoter shall not be liable for any loss or damage whatsoever suffered (including but not limited to direct or consequential loss) or personal injury suffered or sustained during the course of prize winning trips or in connection with any other prizes. Any change in value of the prize occurring between the publishing date and date the prize is claimed is not the responsibility of the promoter. 9. NSW Permit No. TC01/1642. Vic Permit No. 01/567. ACT Permit No. TP01/0656. SA License No. T01/623. NT01/5197.